You can process the content of an Atom 1.0 or RSS 2.0 feed to extract or get details of the feed. 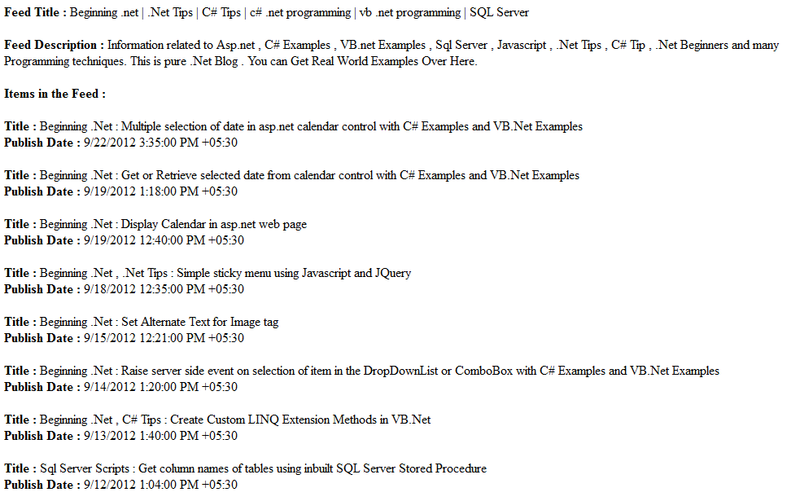 .Net framework provide classes to parse the feed data. We are using System.ServiceModel.Syndication.SyndicationFeedFormatter and System.ServiceModel.Syndication.SyndicationFeed classes. The SyndicationFeedItem and SyndicationFeed classes gives a generic abstraction of Atom 1.0 and RSS 2.0 feeds and feed items, and provide a common interface to simplify the processing of both feed types. The Rss20FeedFormatter class allows to create a SyndicationFeed object from an RSS 2.0 feed, and the Atom10FeedFormatter class provides support for Atom 1.0 feeds. Both classes are available in the System.ServiceModel.Syndication namespace. We are using "ReadFrom" method and "Feed" property of these classes. In this example we read the feed and display it's details. // Create the web request. // Get the data from the feed. // Read the feed data into the formatter. Dim strUrl As String = "http://jayeshsorathia.blogspot.com/rss.xml"
' Create the web request.
' Get the data from the feed.
' Read the feed data into the formatter. Hey. Just wanted to say good example. 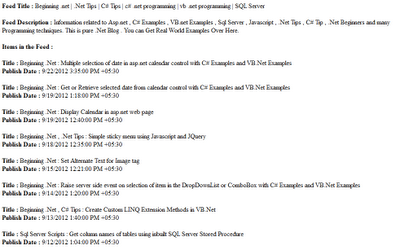 But, it could be done alot easier using Linq. But In my code I demonstrate validating the FEED URL and Step By Step process.